bogof bingo is powered by VirtueFusion and forms part of the VirtueFusion Network. Being part of such a large network provides great benefits such as a solid and diverse range of promotions, generous prizes, security and reliable customer service. 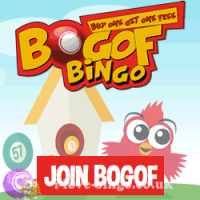 Bogof bingo is bright and vibrant with an easy and reliable navigation located at the top of the website. Operated by playtech, the site is safe and secured and highly regulated. Players can be reassured that their data and transaction are safe.The registration, depositing and withdrawing process is simple and effective. BOGOF start your journey with a mega £20 bonus welcome package (£10 in games and £10 in Bingo) and 70 free spin on your first £10 deposited. All you have to do to snap that up is register and deposit £10– then the free bingo bonus cash is yours. They even gift you with free entry to their excellent Newbies room packed with jackpots for three days after you join.The Newbie Room is designed to make it easy for new players get to grip with the games. It doesn’t cost much to play and the chat moderators are on hand to answer questions.Then it is simply a case of depositing for your 50% reloads and referring your friends for another free bonus of £5 and your account with be full. At BOGOF, there is a wide selection of regular promotions. When we say regular, we mean that they can be found listed at the site no matter what day you visit. These have all been assigned to specific days or time frames and all offer different things. For instance, offers may include Bingo Linx, free bingo, penny bingo and mobile bingo. There are also big money games across a number of different types. The full list is so extensive that it really needs to be seen to be believed. Bogof Bingo does offer players variations outside of 75, 80 and 90 ball bingo. Among the choices are multi-player, Lucky 7 Roll On Bingo, BOGOF Bingo, Speed Bingo, Community Bingo, Deal or No Deal Bingo and Lucky Numbers Bingo. The Virtue Fusion software present at the site ensures that exciting new slots, casino games and scratchcards are released with great frequency. Members can also have access to all the other BOGOF sections with the same account. In other word, should you fancy a play on casino games, you can do so with your bingo account. There is a huge variety of games and products to choose from. Bogof Bingo has a fantastic games portfolio of over 600 games and dozens of products such as live casino, sport betting, binary, poker on offer with multiple bingo rooms to choose from. Players and members will have a choice of over 300 slot machines names, 30 casino games, sports betting, live casinos, 60+ instant games, lottery type games, 50+ scratch cards, binary betting and much more. Players and members will often benefit from offers and bonuses on many of the games displayed. Bogof Bingo games and bingo are available on PC, laptop, iPad, Iphone and androids.